I am flummoxed! I want to enable learners to print their answers to multiple "Pause and Reflect" questions so they can track how their answers change as they go through a learning process. So I first put the questions in as surveys, but can't get the actual text of the questions to print in that case. So I changed them to quiz questions, and now I can't get it to print without saying "Incorrect" and showing they failed. Can I JUST print the questions and their answers, with no score or feedback? You can certainly set up your "Pause and Reflect" questions as Survey Essay Questions. 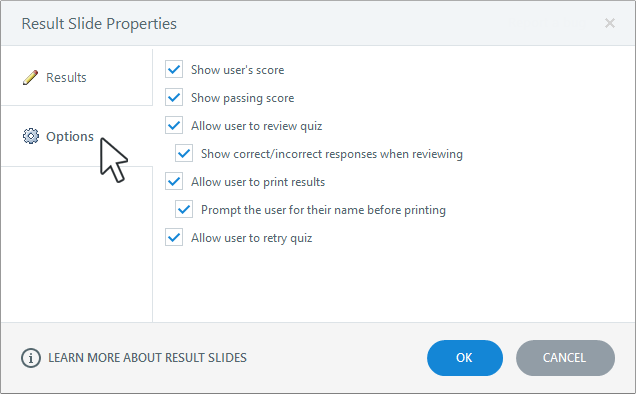 If you want to allow users to print their answers, you'll want to add a results slide to your course. Within the Results Slide Properties, be sure Allow user to print results is checked. You can read more about adjusting the results slide options in this article. Thank you, I have read that. I did just figure out how to get the question to print, I think I had reformatted and it was not recognizing it as the survey question. But I do not like how it says, "Neutral" and lists the points awarded. Can I get rid of that? I believe you will have to edit the report.html file to remove the result and points awarded. Editing the HTML file is not something we support, but hopefully some of your fellow community members can assist with this. Also, please feel free to share your input on a built-in print result customizer. We take our customers' feature requests very seriously, and your feedback helps us determine what to implement in future builds. "Hi Sarah! You can certainly set up your "Pause and Reflect" questi..."